You will receive your order within 10-15 business days. 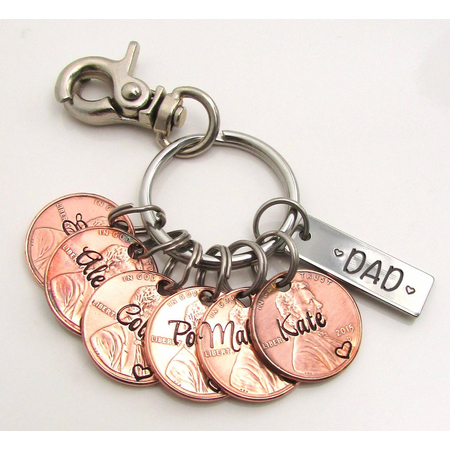 A thoughtful gift for your Mom, Dad, Aunt, Grandma, Grandpa or anyone you love where they will cherish your names in their keychain for a lifetime. The pennies can be personalized with up to 8 characters straight across or if you need longer we can do it on the curve instead. The steel bar can be personalized with up to 16 characters, including the hearts shown. For any special instructions, add them at the time of checkout. Please input your custom text before proceeding to checkout. You have reached maximum character limit. Maximum possible character limit is 500. Please input your custom text before proceeding to checkout. You have reached maximum character limit. Maximum possible character limit is 100.